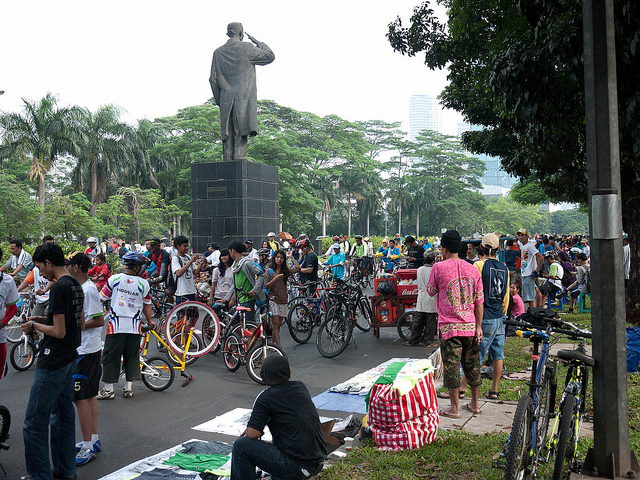 Attempting to evade the city's congested car traffic, more than 50,000 residents in Jakarta, Indonesia bike to work. Photo by nSeika. The U.S. Dept. of Energy released two online tools to help communities implement electric vehicle infrastructure. China will invest 1.27 trillion yuan (US$199 billion) in subway and light rail lines through 2015, reported the official China Securities Journal last Friday. The Turkish high-speed rail line linking Ankara with Konya opened this week. The world vehicle population surpassed 1 billion in 2010, according to Ward Research. Calls for a ban on bicycling in Israel ensued after a deadly cyclist crash in the country last weekend. China’s high-speed trains remain a popular transport option as ridership remains high, despite the train crash that claimed 40 lives last month. In the face of extreme traffic congestion, bicyclists of Jakarta, Indonesia amassed a Bike to Work community of more than 50,000 members. The Consulate General of the Netherlands, with support from the City of Los Angeles, will host a two-day workshop in Los Angeles in late September to support L.A.’s bicycling infrastructure. The world’s largest bicycle maker, Hero Cycle, partnered with Allahabad-based Sonata Finance to provide loans to Indians in rural areas to help finance bicycle purchases. UPS is purchasing 100 fully-electric commercial delivery vehicles for use throughout California. The move marks one of the largest commercial electric-vehicle deployments in the world. General Motors and LG Group signed a joint agreement on Wednesday to partner on future electric vehicle production. LG Group had previously provided the battery cells for the Chevrolet Volt. A research team at the Massachusetts Institute of Technology and Princeton University pioneered a new traffic signal schedule advisory system that uses a network of smartphones mounted on car dashboards to collect traffic information. Tests found that drivers who use the system cut fuel consumption by 20 percent on average. The California Air Resources Board (ARB) voted to reinstate the state’s greenhouse gas emissions cap-and-trade program and approved an updated environmental analysis of the state climate plan. Transport for London announced a collection of initiatives aimed at reducing pollution levels by 10 percent to 20 percent on London’s busiest roads. Canada is following in the United States’ footsteps in developing similar greenhouse gas emission regulations of heavy duty vehicles. In anticipation of Hurricane Irene, MTA Long Island Rail Road, like other transit providers, is reducing service this weekend. Mothers Against Drunk Driving (MADD), a U.S.-based not-for-profit that seeks to end drunk driving, appointed a new president, Jan Withers. August is the most deadly month in the U.S. for drunk driving. The percentage of bicyclist crashes per rider in Washington, D.C. has decreased as bike lane mileage has increased. Washington Metropolitan Area Transit Authority (WMATA) responded to Tuesday’s East Coast United States earthquake with Metro-related updates on Facebook and Twitter, submitting press releases, posting additional signage, dispatching extra workers, and even projecting news updates on the teleprompter at the Nationals’ baseball game. The tenth edition of the “Building Carfree Cities for the People, by the People” will be held in Guadalajara, Mexico this year on September 5 – 9. The conference aims to empower people to encourage policy reform.